A one-stop source for all your manufacturing and short run stamping needs. We are conveniently located in Avon Lake, Ohio; just 20 minutes west of Cleveland. Please feel free to give us a call Monday through Friday, 7:30am to 4:00pm, if you have any questions about our operations and what we can do for you. 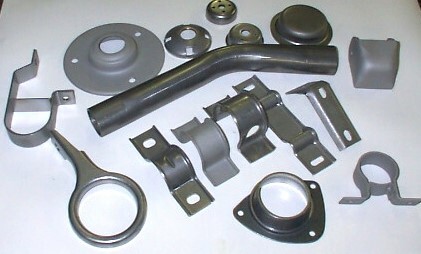 Short run metal stampings specializing in stainless steel. We also work with all grades of Steel including HLSA and spring alloys, Aluminum, Copper, Brass, Bronze, Nickel alloys, Titanium, and some plastics and polymers. Design and Manufacture of Specialized tool and die applications including Compound, Single Hit, Progressive and Blanking Dies. Design and Manufacturing of Jigs and Fixtures for small and large applications including Machinery Modification. Quick turn-over time for prototype design and delivery. Proficient in secondary assembly including heat-treat, plating, drilling, spot welding and TIG welding up to 175 amps. Die repair and tool sharpening. Short run turning, milling and grinding. Blanchard grinding capacity up to 30″. Delivery in the Northeastern Ohio area (call for details). Low cost start up and shorter lead-times. Tooling can be built quickly. Products can be put into production quicker. Short run stampings and fabrication have a lower tool cost. 20XX Hashier & Hashier Manufacturing Inc.